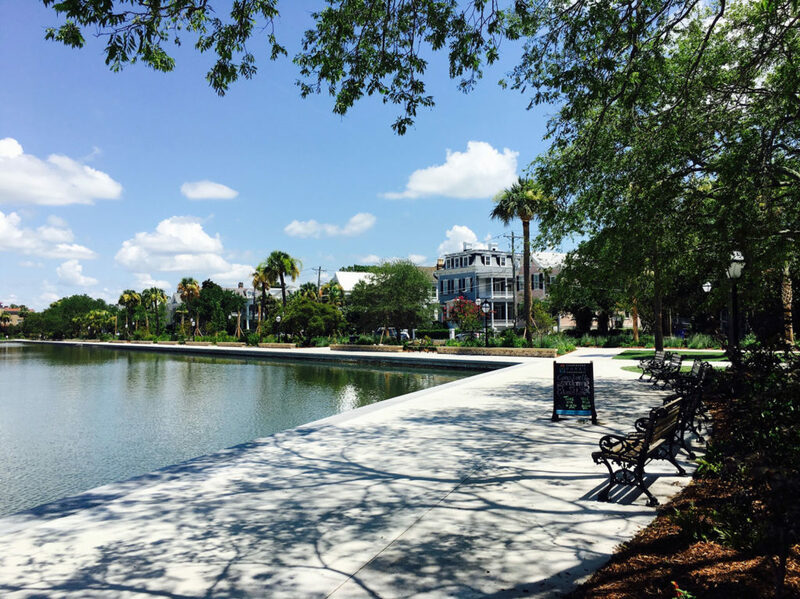 Colonial Lake is an iconic nine acre park in the heart of Historic Charleston, SC. 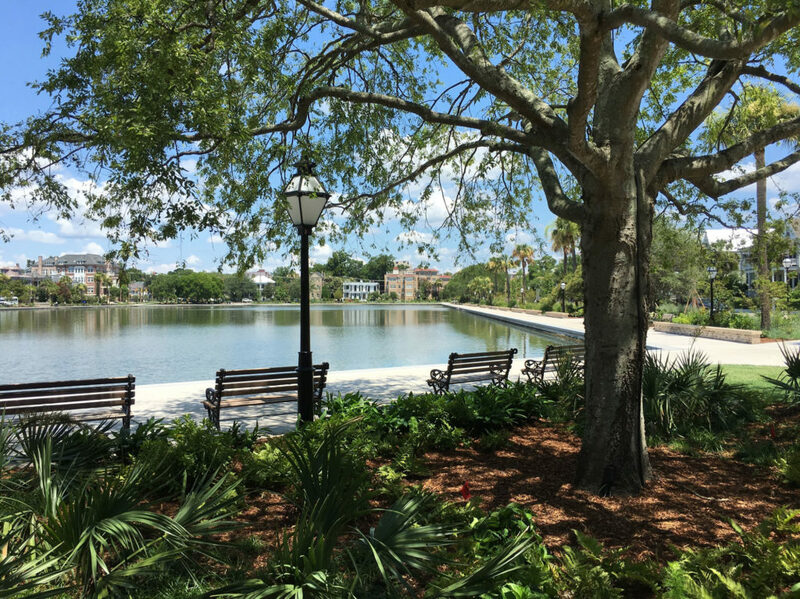 Constructed in the early 1800s, the park received minimal repairs until this $5.9 million dollar renovation. 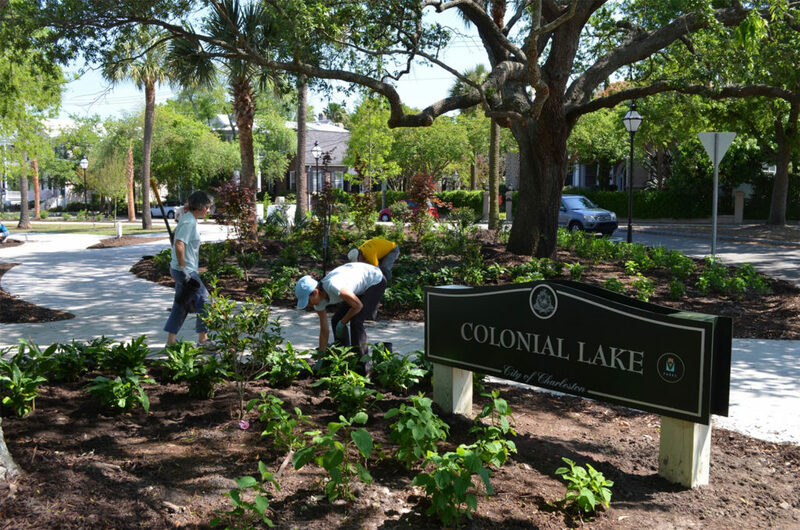 This endeavour was a private/public partnership with Charleston Parks Conservancy (CPC) and The City of Charleston. 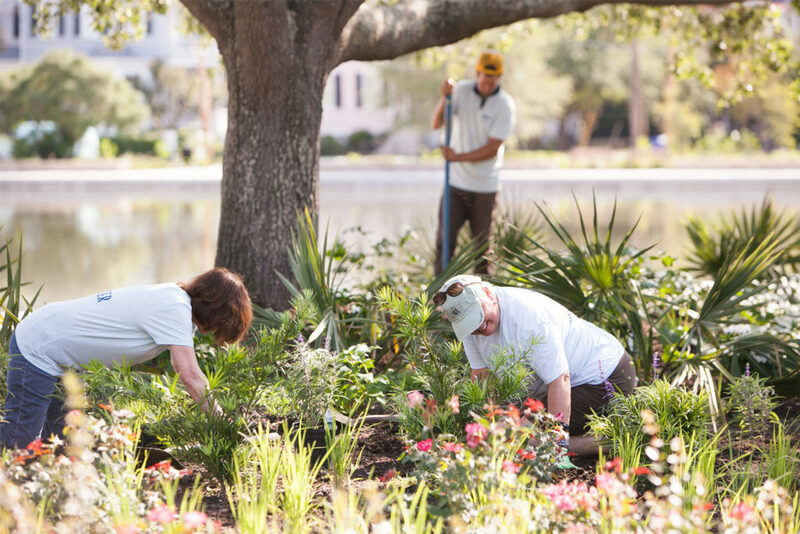 Founded in 2007, the CPC unites local resources, leverages support and organizes volunteers to be stewards of Charleston’s urban parks. 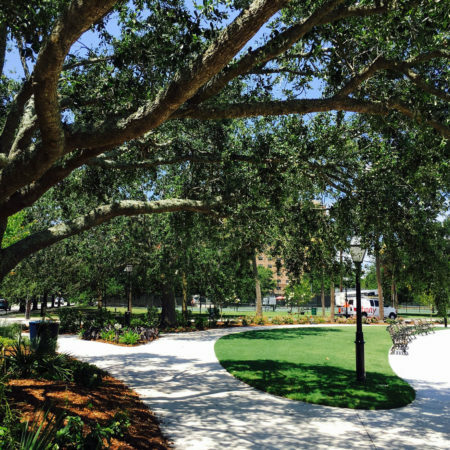 The first phase of the Master Plan began in 2014 and renovations were completed in 2016. 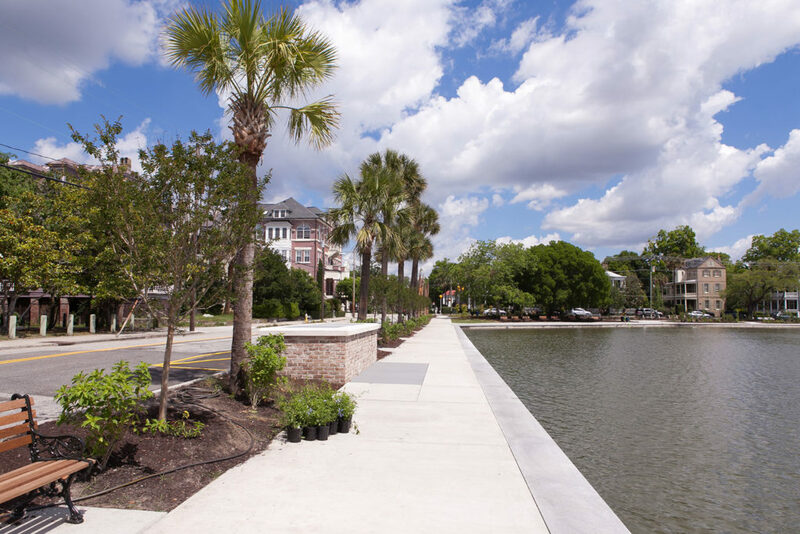 DesignWorks led a team of consultants, including the horticulturist from the CPC, civil engineer, lime tabby consultant, soil engineer, lighting engineer and historic/cultural resources consultant. 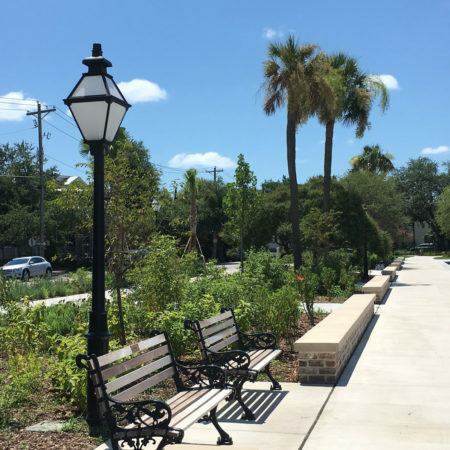 DesignWorks led all aspects of the project from Conceptual Design through final construction including community outreach, fundraising assistance and agency approvals. 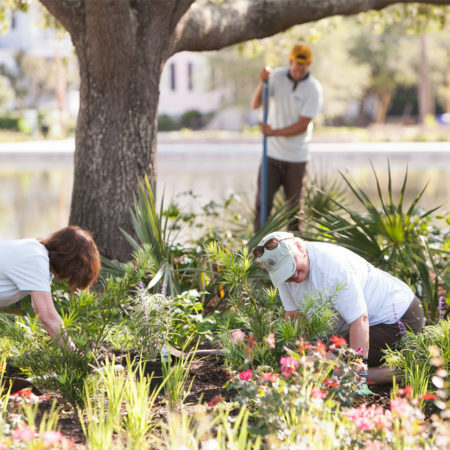 The CPC has orchestrated over 30,00 hours of volunteer time from it’s Park Angels for planting and on-going maintenance at the Lake. 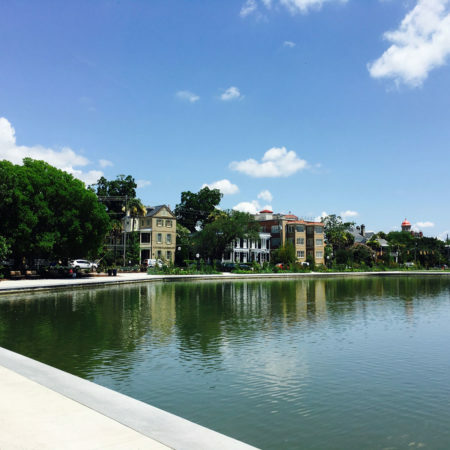 Work began with a master plan for the park, the adjoining Moultrie Playground and the connection of both to the Ashley River. 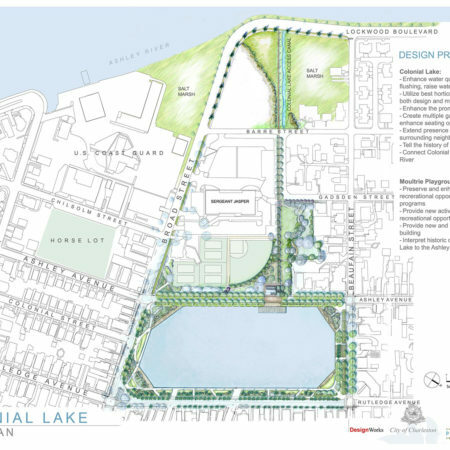 The initial planning effort focused on the history of the development of Colonial Lake. 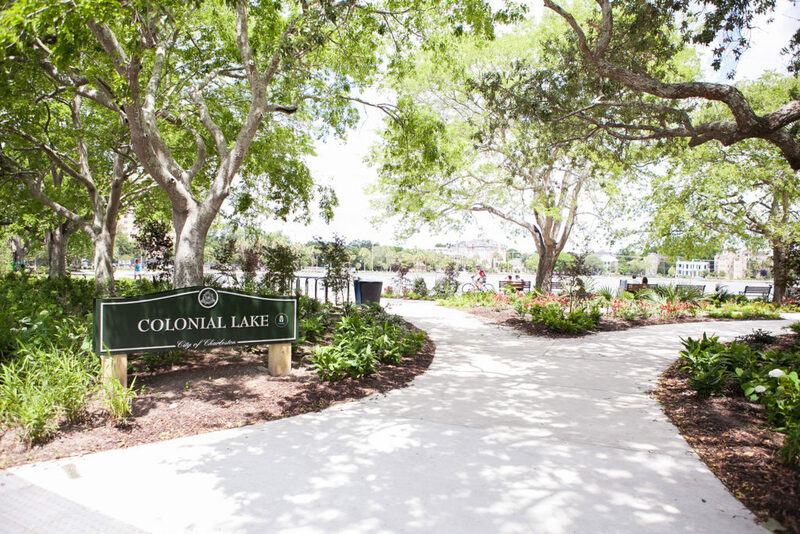 The investigation revealed that Colonial Lake had many different configurations, each responding to different forces at work in the city over the span the Park’s life. 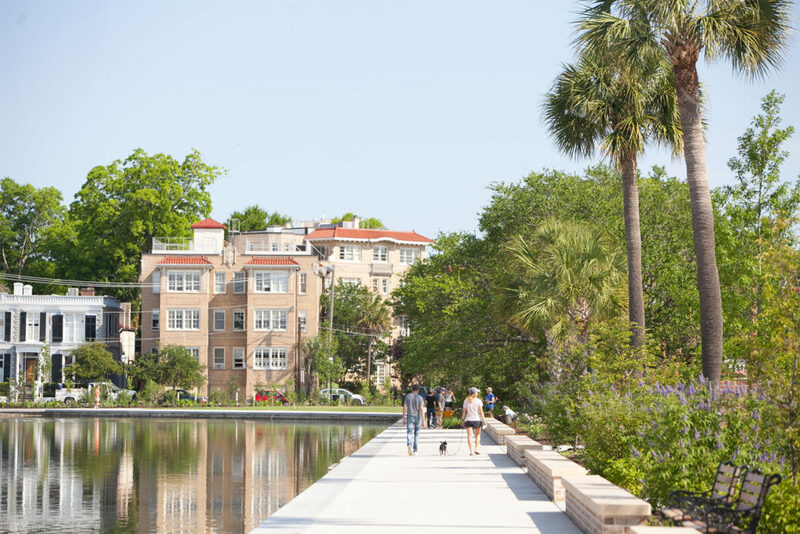 Colonial Lake was the City of Charleston’s first true public garden. 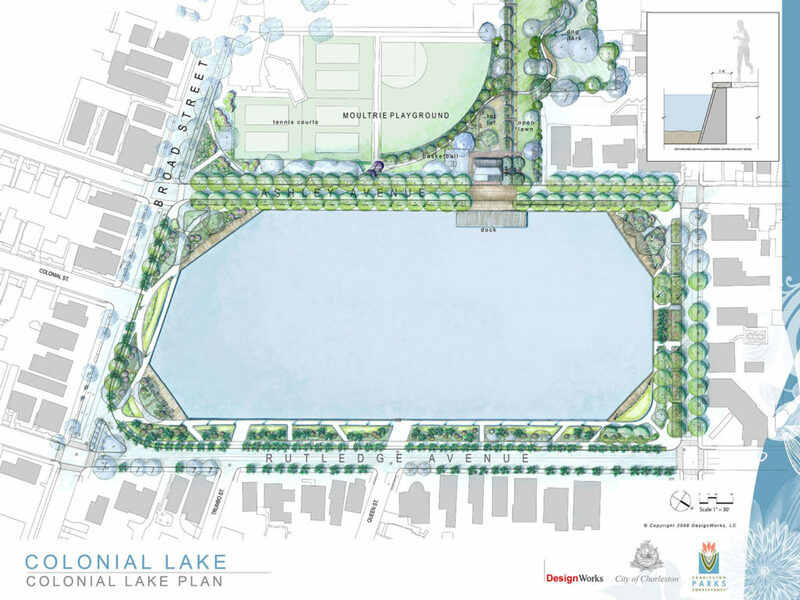 DesignWorks led a series of neighborhood meetings, set up in tents within the park, to understand the aspirations of the citizens who utilize the park. 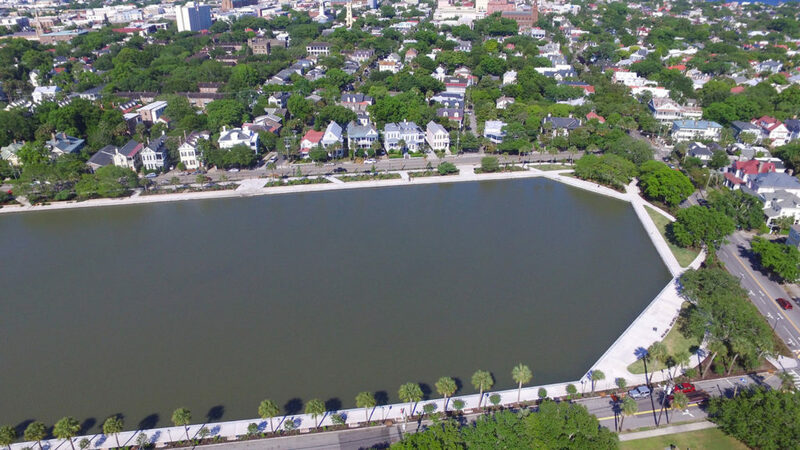 A series of goals and objectives were generated from the neighborhood meetings that focused not only on creating a great park, but also on improving water quality within the basin, expanding the presence of Colonial Lake within the neighborhood context and reconnecting both parks to the Ashley River. 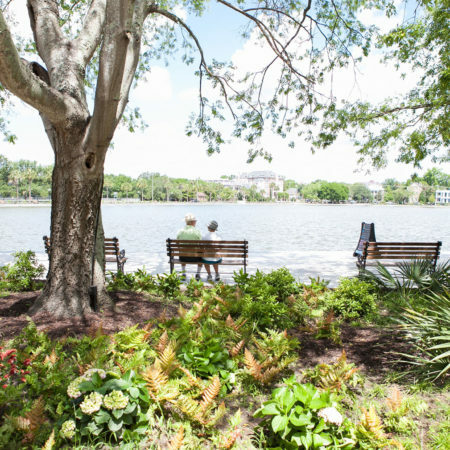 – Enhance Water Quality- both environmentally and aesthetically, improve oxygen and nutrient levels, circulation and elevation. 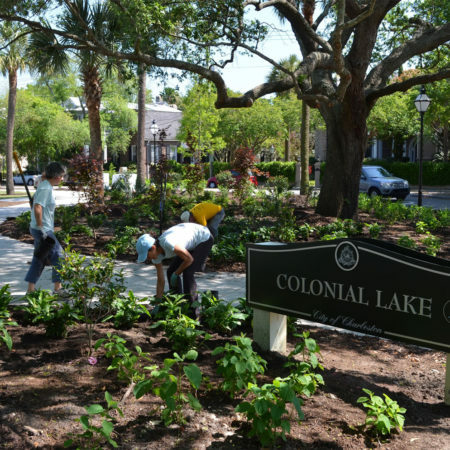 – Create a High Quality Public Garden- sophisticated planting design enabled by enhanced maintenance. 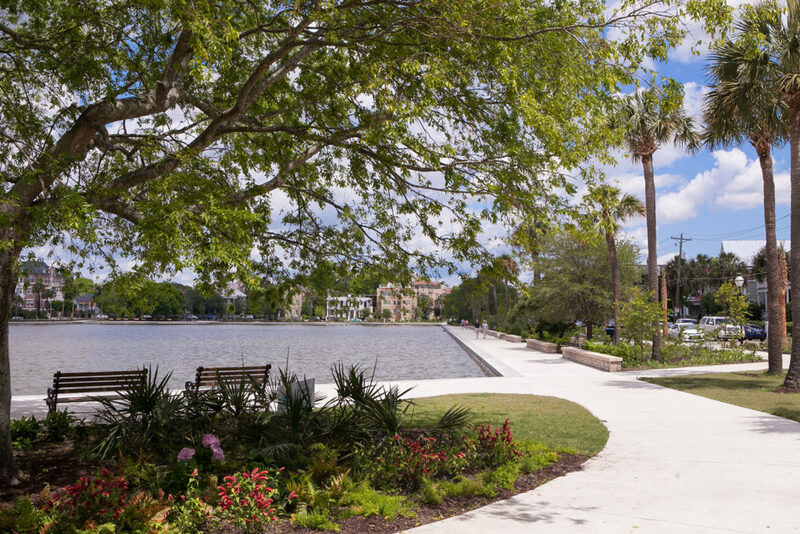 – Enhance Promenade Experience- expand the park by decreasing street widths, provide additional and improved pathways, seating an lighting, cast the water edge in granite, rebuild the historic sea walls. 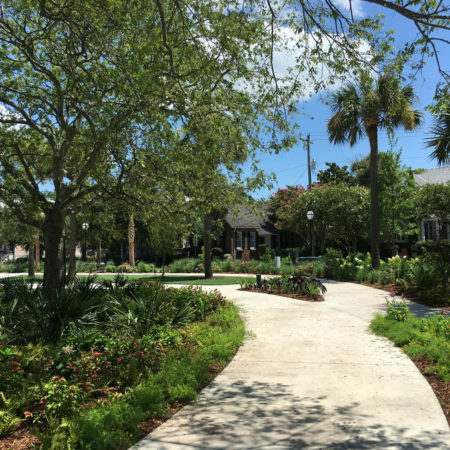 – Create Gathering Places- provide places for the neighborhood to come together and to establish new rituals. 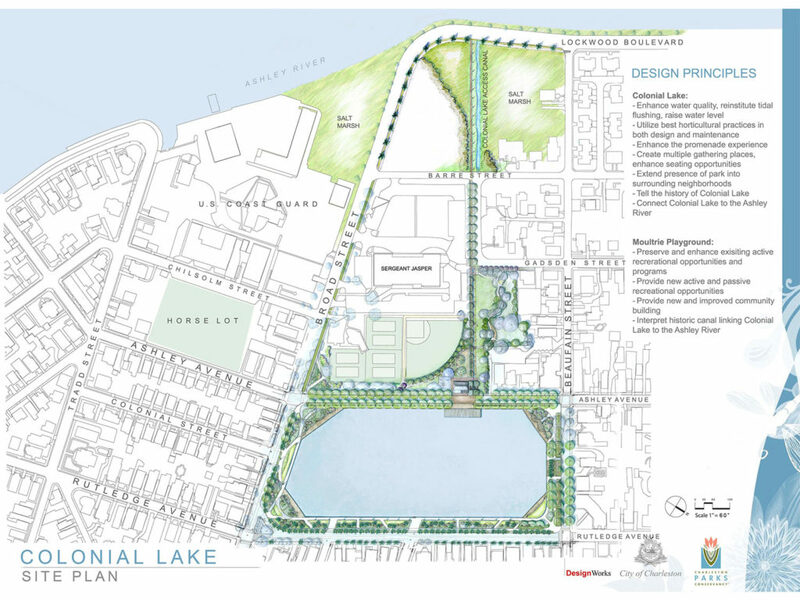 – Extend the Presence of the Park in to Neighborhoods- Improve Visual and Physical Connections. 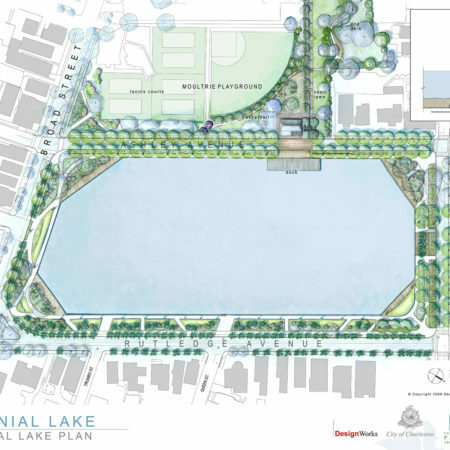 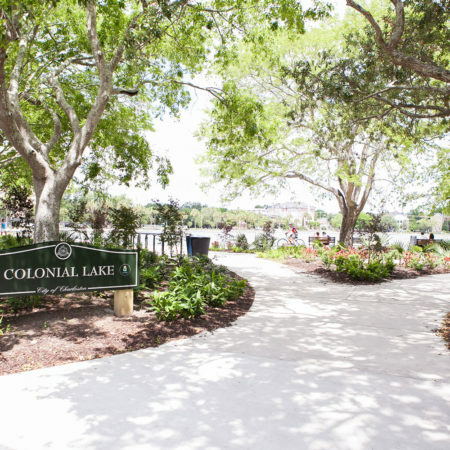 – Tell the History of Colonial Lake- respect and reveal the past but design for today and the future. 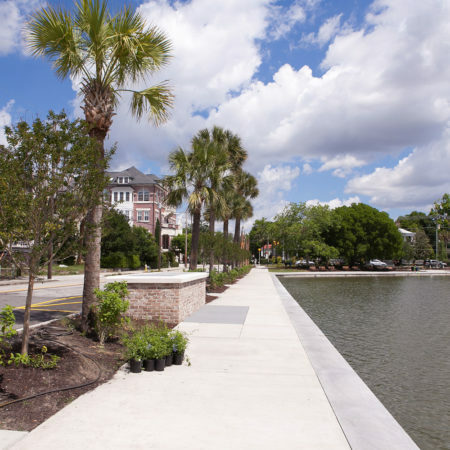 – Connect Colonial Lake to the Ashley River- restore historic visual and physical connections, plan for enhancements to adjoining Moultrie Playground. 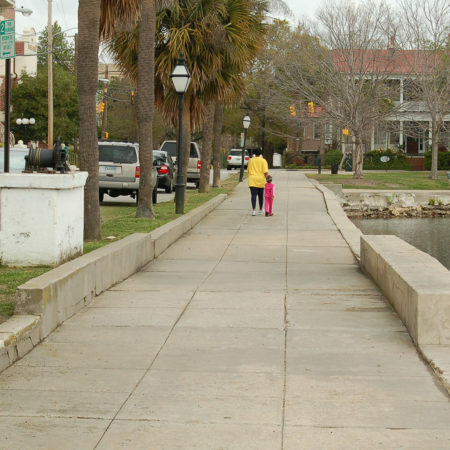 The water basin was fed, via an open channel and below grade conduits, from the Ashley River. 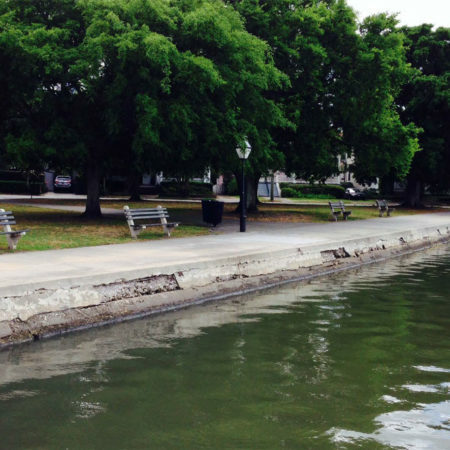 The single control structure for this feed was damaged during Hurricane Hugo in 1989 and never repaired. 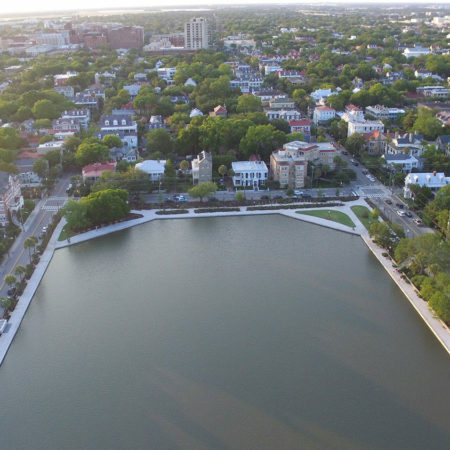 An additional pipe connection was created and a new control structure was installed to enhance water quality, herein defined as having the water in the basin match as closely as possible the water quality in the Ashley River. 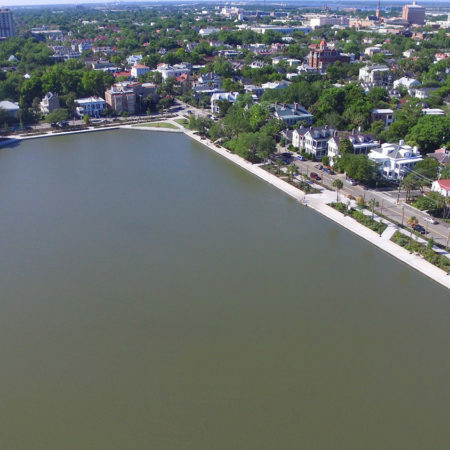 Water quality was also defined as having the water level in the basin be within 12” to 18” of the level of the surrounding promenade. 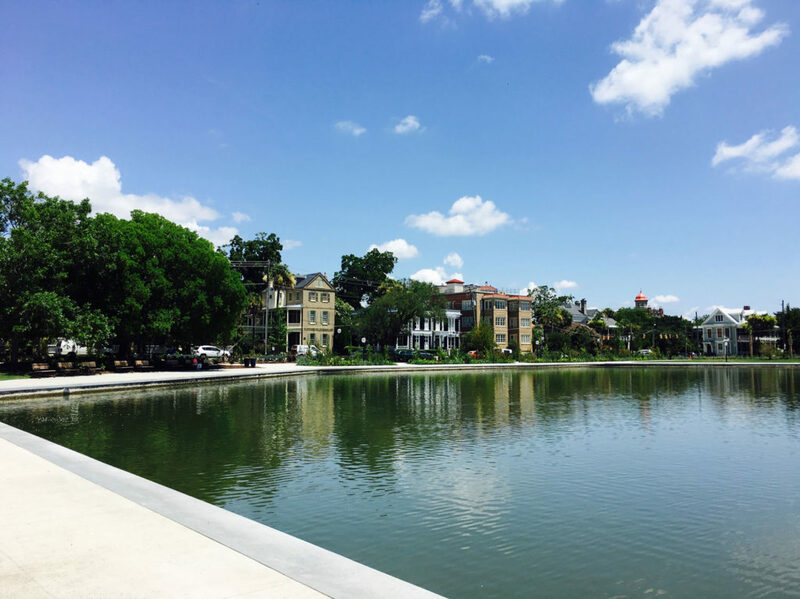 A water testing and management program was established. 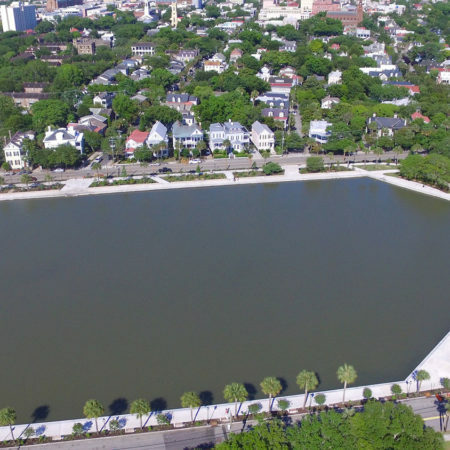 The basin is now able to be lowered prior to storm events to increase storm water capacity. 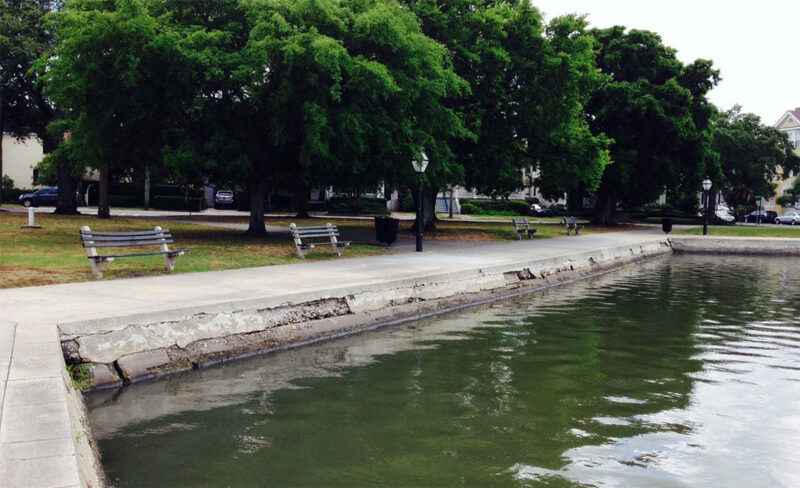 The historic seawalls were originally constructed with a lime based tabby composed of oyster shells. 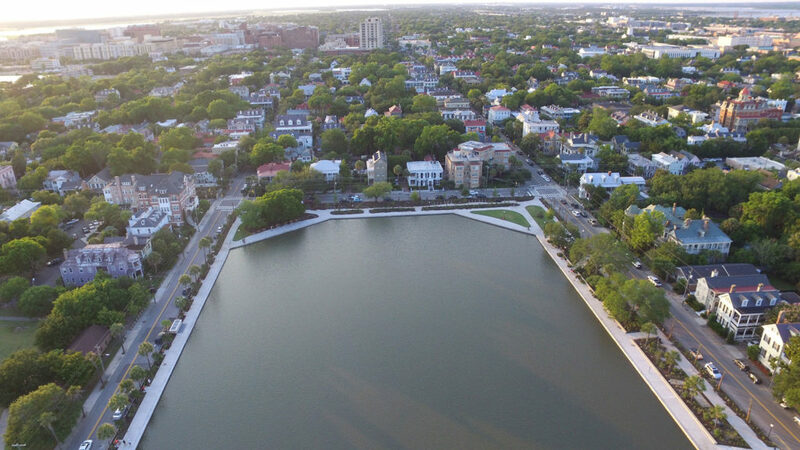 lime and sand. 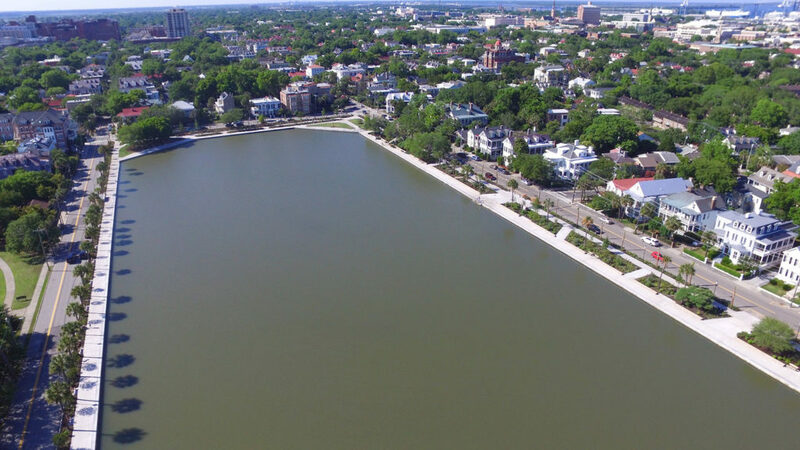 Past repairs were done with incompatible Portland Cement Concrete. 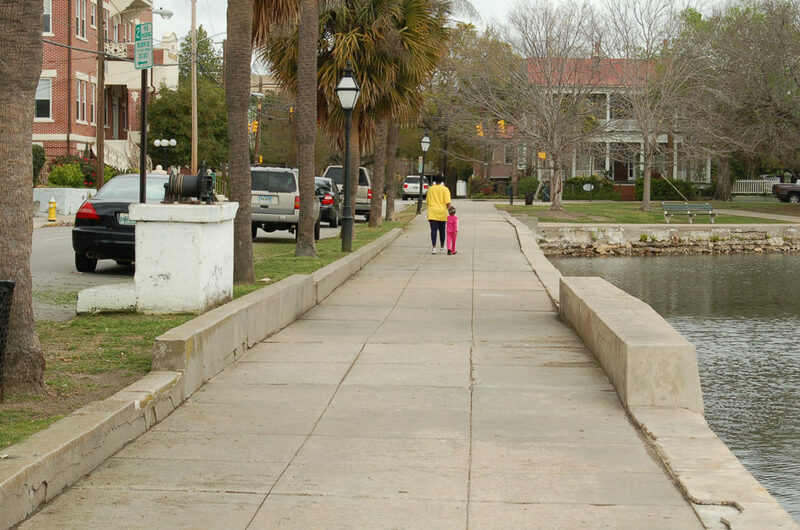 This material was removed and the tabby wall was appropriately repaired and exposed to view. 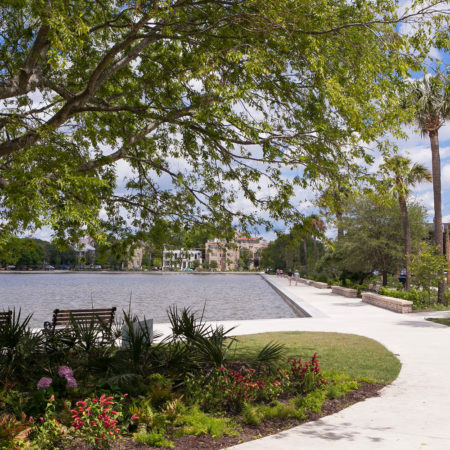 The promenade around the basin is enhanced with new paving and a new granite copingstone to crisply define the edge. 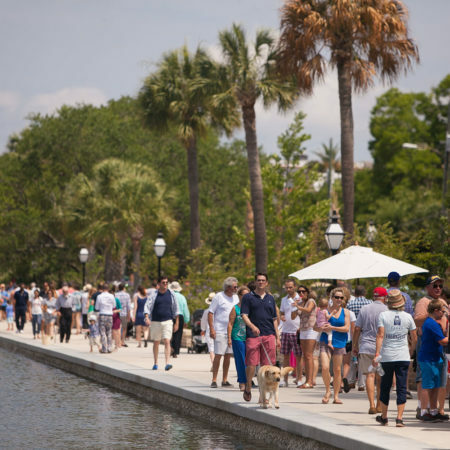 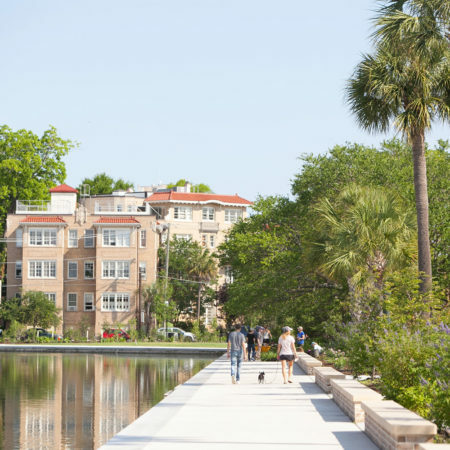 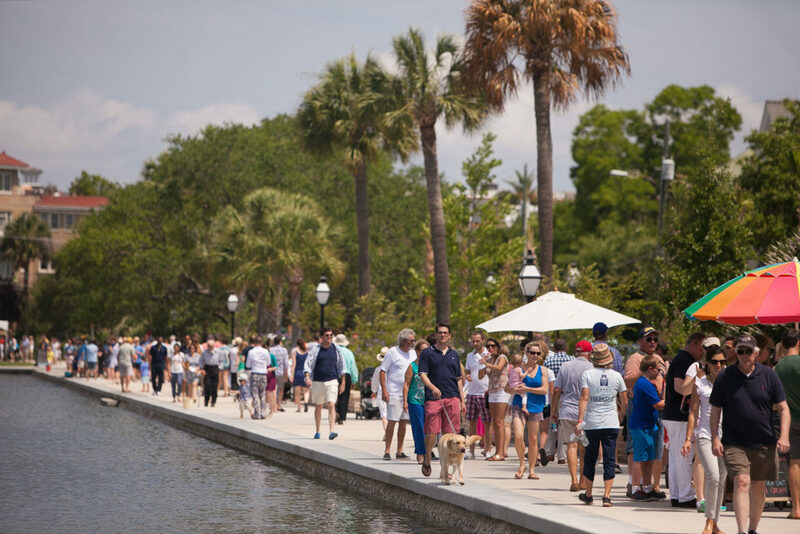 Garden paths veer off the main water edge promenade to reveal four distinct plant communities: Historic Charleston Garden, Palmetto and Crepe Myrtle Promenade, the Marsh Edge Community and a Native Perennial Garden. 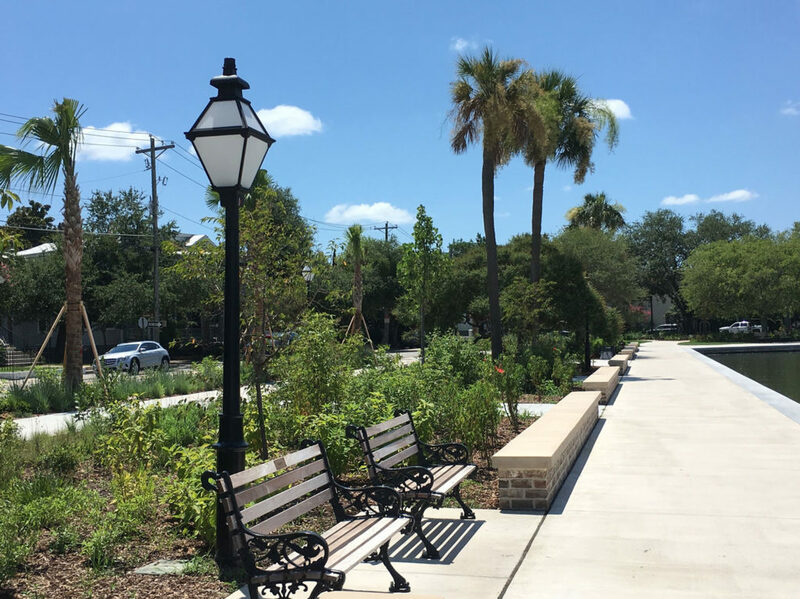 New light poles, cast from the historic poles found around the basin light the promenade. 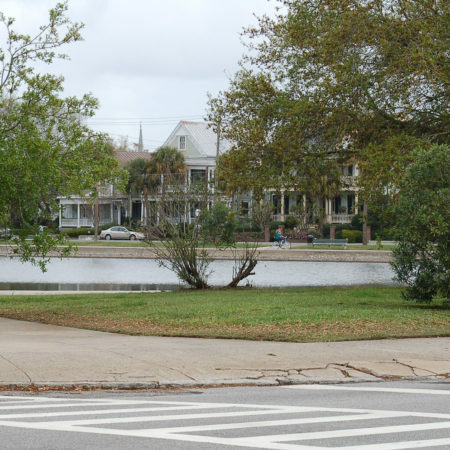 Surrounding streets were narrowed to calm traffic and increase the size of the park. 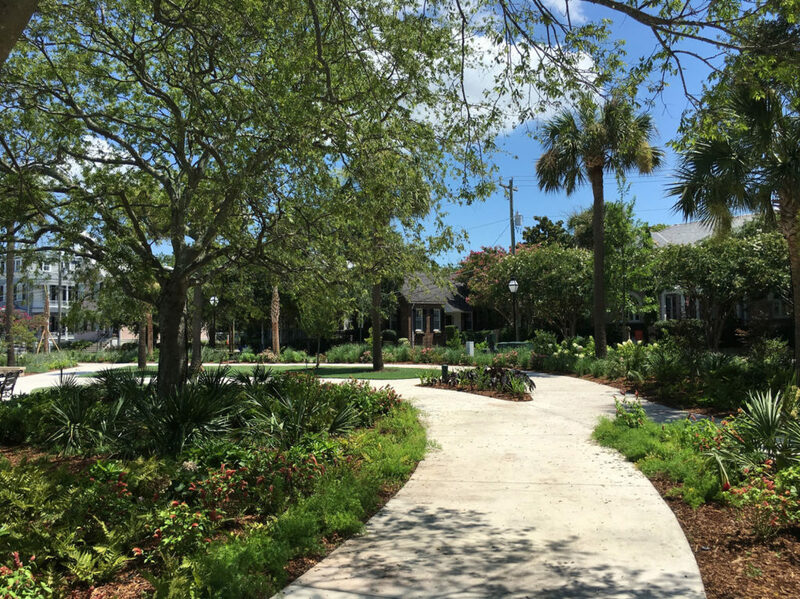 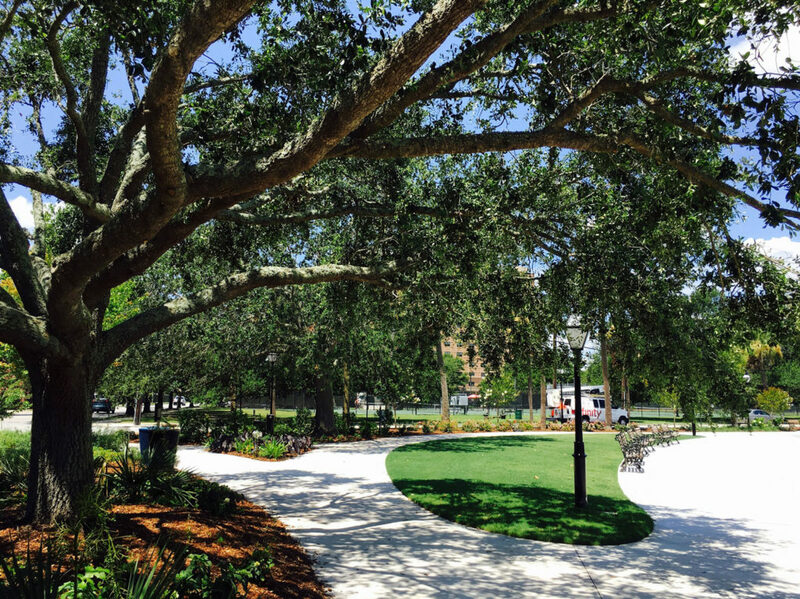 Other highlights of the park include additional open space and more shade trees as well as new sidewalks and expanded space for walking and jogging. 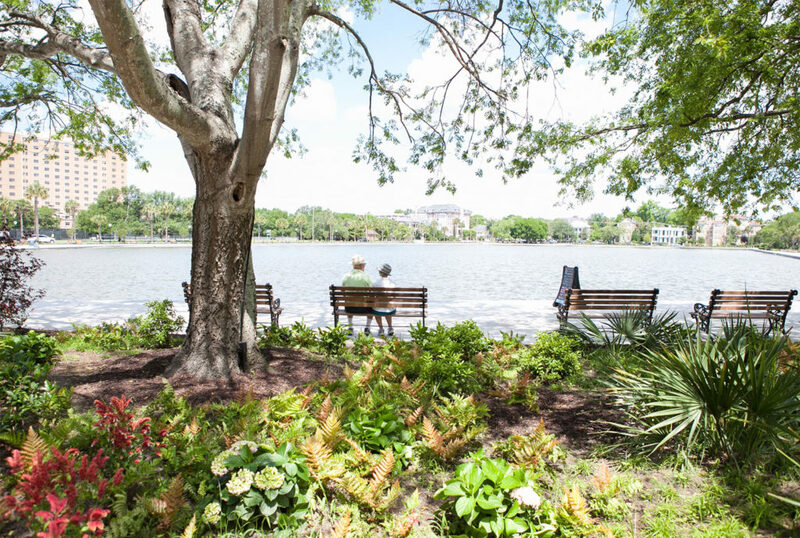 The new park has nearly three times more benches and a seat wall along Rutledge Avenue that dramatically expands the amount of space for visitors to sit and admire the lake and gardens. 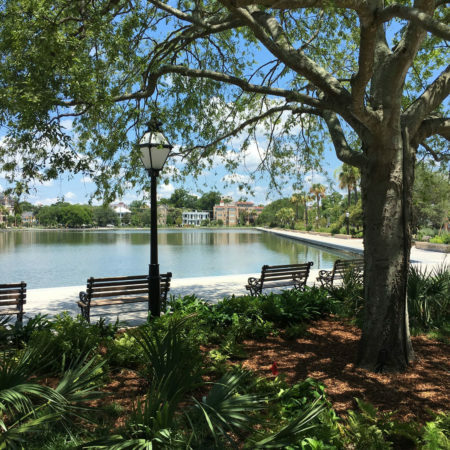 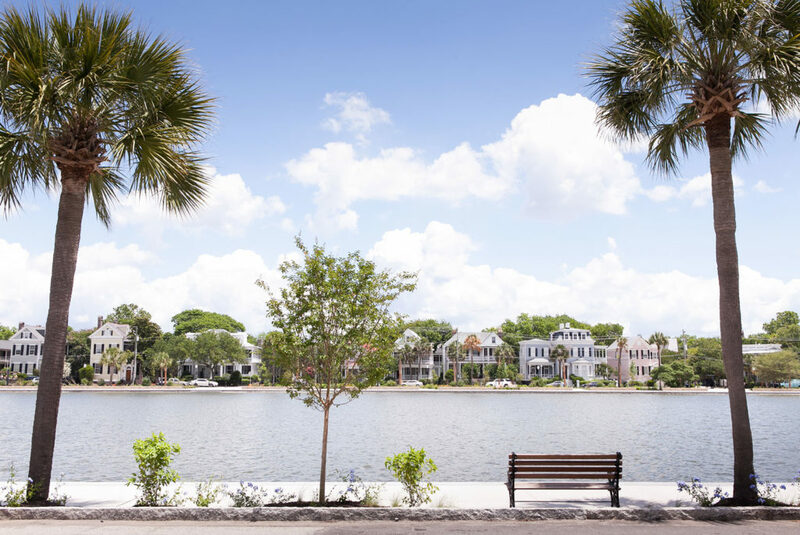 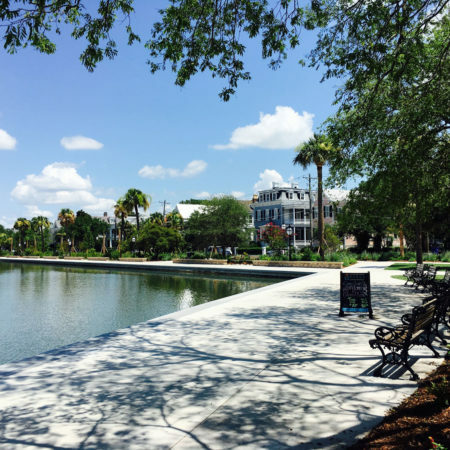 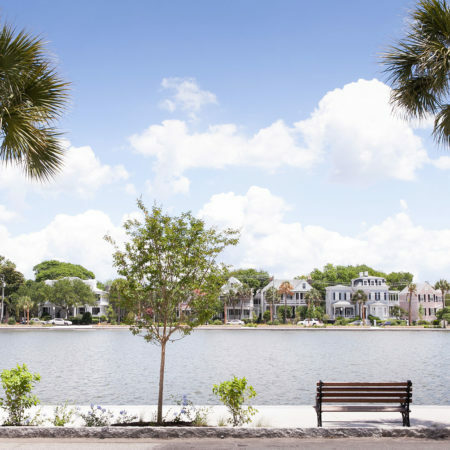 Colonial Lake is one of the most loved parks in the City of Charleston today. 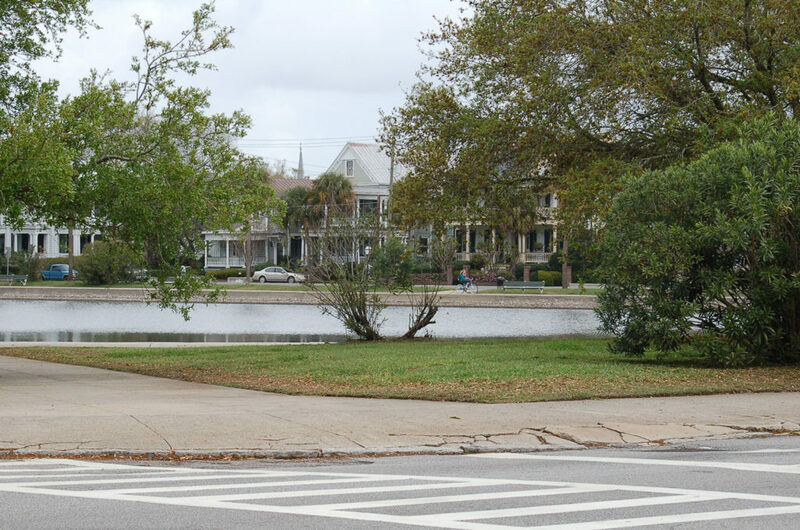 Fundraising for the renovated Moultrie Playground is currently underway with the CPC.